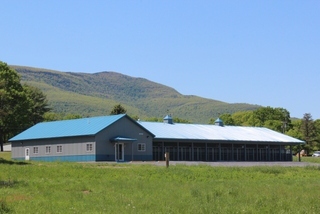 Thank you for visiting Catskill Mountain Bed N Biscuit, your full service pet resort nestled in the beautiful Catskill Mountains! Our building is state of the art, modern, clean and comfortable and we offer personalized care like no other boarding and grooming facility around. Owned and operated by professional handlers with decades of experience, Catskill Mountain Bed N Biscuit is your Best Choice when you want to leave your Best Friend in capable and loving hands. While you're gone, let them vacation with us! We offer a wide variety of services from boarding and grooming to pet day care and long term accommodations. Please browse our site and call or email us with any question or to book a reservation. Even better, come on in and take a tour of our facility. We love showing it off! We are on Rt. 32, just 8.3 miles north of the NYS Thruway intersection in Saugerties, 7.6 miles south of Cairo, from Catskill, take Rt. 23A West for 6 miles, then turn left on Rt. 32 , we're just 1/4 mile on left.